Richard Renaldi's News and Events: SKATEBOARDING.3D. Last weekend in Hamburg, I met photographer Sebastian Denz. He was looking through some photography books in the office at the Robert Morat Galerie. It came up that he is photographer as well, and that he has a book that was recently published by Prestel. Fortunately, Robert had two copies left. 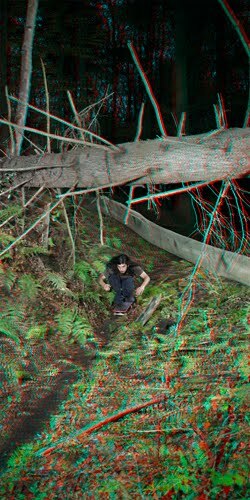 His book is in 3D, and about skateboarders. In the milliseconds before the book was opened, and I put on my 3D glasses, I made an instant judgement that this was going to be a bit gimmicky. That's the problem with instant judgements, as I was immediately blown away by quality and the strength of the photographs. They are beautiful. If there ever was a subject to be photographed in 3D - skateboarding really lends itself to the medium. It is extremely spacial. Sebastian shoots with a large format camera that is specially designed for making the clearest sharpest 3D photographs you have ever seen. He has some interesting thoughts about space and our relationship to it in his writings and interviews found on his website. This book is a must have.